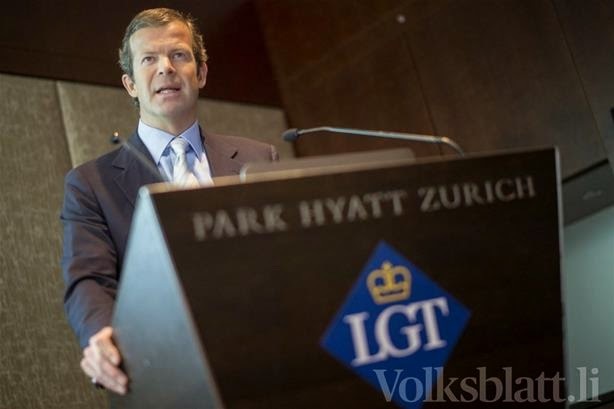 During a media briefing today, the LGT Group, the Princely Family's bank, announced that net profits rose more than 18 percent last year as the bank attracted fresh funds and acquired a large portfolio of accounts from HSBC's private bank. During the meeting, Prince Max stated that he believes that "some, and I count Liechtenstein among them, will have gone from A to B in a relatively smooth sensible way, understanding pretty early on in the process what the trends are and positioning themselves accordingly, and others will struggle much harder" when asked about Liechtenstein positioning itself as a financial centre for clean money during the past few years. Pictures of the press meeting in Zurich at Volksblatt and Vaterland.